Introducing our new Stylist Lucy…. A huge welcome to our new recruit Lucy. 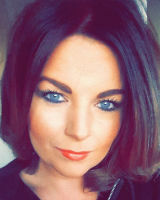 Meet our new recruit Lucy who has over 8 years of hairdressing experience under her tool belt after working at two other local salons in the area. Shes qualified and experienced in all aspects of hairdressing, colouring being her favorite. She’s worked with a selection of professional colours at her previous salons but since joining Caprio’s and using Matrix colour says she much prefers the vast choice of colours it offers and says the coverage is far better than the brands she’s used in the past. She particularly loves colour correction and feels a huge sense of achievement in transforming tired, dull locks into beautiful , shiny, healthy hair. On meeting Lucy you will be greeted by her professional, friendly and welcoming personality and with her expertise and knowledge you can be assured that your precious locks are in safe hands. To book an appointment with Lucy call us on 01384402890 or book On-line ( Styling services only) via our ON-LINE booking facility.